At the start of the new year, the Japanese automakers will show off their new vehicles, and we also get to see what the future will look like. Subaru has announced they will be bringing a number of new sport concepts to the 2013 Tokyo Auto Salon that starts on January 11th. Last year we got to see the new BRZ STI concept that gave a glimpse of a high-performance BRZ with custom aerodynamics, larger 18-inch wheels, a light weight carbon fiber hood, custom exhaust and a carbon fiber roof. 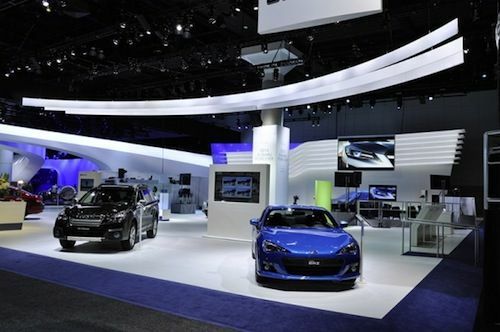 At this years show, Subaru will be bringing three new sport concept vehicles to the show. They will feature a BRZ Premium Sport Package concept that we can only guess will be a further performance package of the BRZ STI that Subaru is planning for 2014. The BRZ Premium Sport Concept could be fitted with a carbon fiber roof, 19-inch sport alloy wheels, an STI aero kit, a sport-tuned exhaust and a custom interior. We know the new 2014 BRZ STI will get substantial upgrades over the base BRZ and will be coming here to the U.S. next spring. We can expect upgrades to the intake system on the 2.0-liter boxer engine that is reported to bump the horsepower from the current 200 hp to around 220-230 horsepower. Subaru will also be bringing two more new sport concepts to this years show. They will feature a new Forester Sport Concept that could be a sport version of the all-new 2014 Forester that will be launching next year. The Forester Sport Concept could see STI goodies like a rear spoiler, a custom front grille, sport suspension and 20-inch wheels. The 2014 Forester broke cover in Japan last month and a new sport version would add even more excitement to the new model. The third sport concept Subaru will be unveiling will be a XV Crosstrek Sport Concept. It will likely see the same performance enhancements as the Forester. The 2013 XV Crosstrek was introduced earlier this year and the first one-month sales figures have more than quadrupled initial sales targets by Subaru. The XV has launched globally and is selling well around the world. A new sport variant of the XV would likely propel the new crossover to greater heights and success around the world. Subaru will also be unveiling a BRZ “Gazoo Race Car” that they say is a tentative name for the race car that could be a collaboration with Toyota for a GT86 race version as well. They will also feature a WRX STI specification group R4 Rally Championship car at the show next month. Along with the cars, Subaru will show off their next-generation D-4S boxer engine and a Turbo DIT direct-injection engine and both will feature cutaway models. The new Subaru BRZ Premium, Forester and XV Crosstrek Sport Package Concepts and engines will show us what the future could look like.